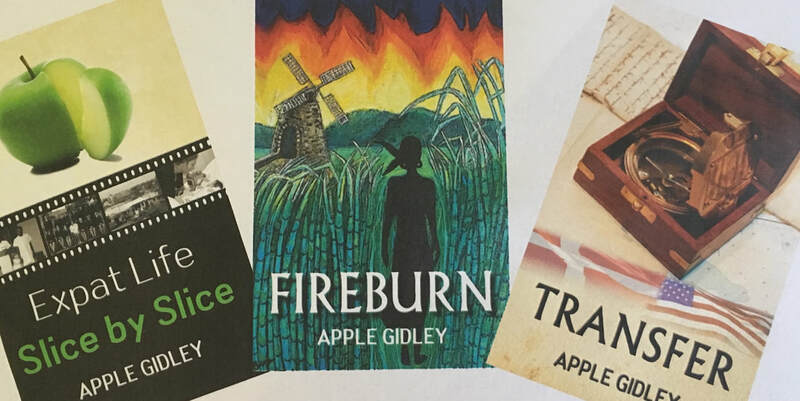 Cultures and customs are vividly brought to life through Anglo-Australian writer Apple Gidley, who has lived and worked in countries as diverse as Papua New Guinea, Thailand, The Netherlands and nine others. Fireburn set in the Danish West Indies of the 1870s, tells a story of those who live at Anna's Fancy, a sugar plantation on St Croix. Thirty years after emancipation, little had improved for the workers which led to the labour revolt known as 'fireburn'. The repercussions of Fireburn impact all on the island, especially Anna Clausen and all at Anna's Fancy. Transfer, the sequel, takes the next generation at Anna's Fancy through tumultuous times as they travel to England, Denmark, France and back to St Croix and live through the transfer of ownership of the Danish West Indies to the United States. ​Expat Life Slice By Slice, tells of her varied roles including editing a regional magazine for an international charity, selling dive equipment, springing Distressed British Nationals from gaol, teaching English in an African barrio, among others.